Admissions Open at Lahore University of Management Sciences's Lahore Campus for the batch Fall 2016. LUMS offers admissions in different fields of study for Masters, and Phd. 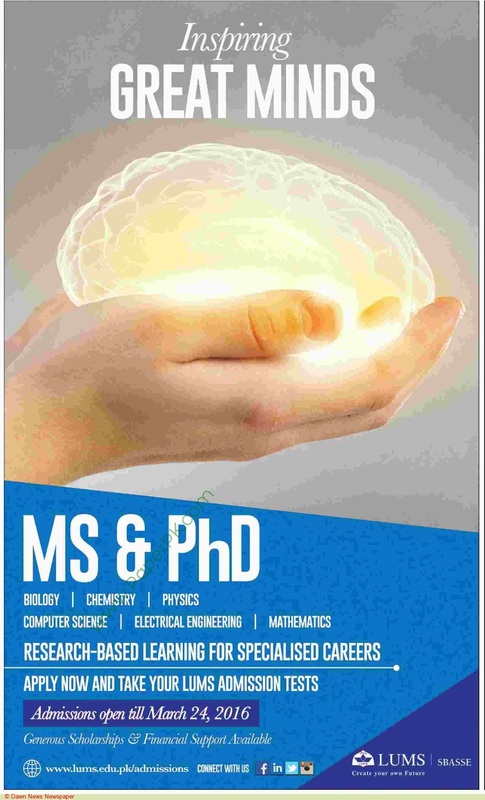 you can apply for , MS - Master of Science, and MSCS - MS Computer Science, Phd - Doctor of Philosophy. LUMS offers admissions for chemistry, mathematics, physics, electrical engineering, computer science economics, biology and PhD admissions. financial assistance is also available for students. university will live webcast the open day on http://live.lums.edu.pk december 18, 2015, and students can also visit lums lahore campus on december 20, 2015 and in Karachi/Islamabad on december 26, 2015. Admissions Dates changed, new last date to apply is Thursday, March 24, 2016. change in other important dates is.